As a former sufferer this is what it feels like to have anxiety. Most people don’t know what a crippling thing anxiety can be. They’d say that I was overthinking things and was taking everything too seriously. But in my mind everything was serious and I couldn’t stop myself from overthinking. It was torturous. I had this constant negative voice in my head that I couldn’t shut off and my mind was racing. I could find fault with anything faster than anyone I knew. A reason not to go somewhere, a reason not to do something, a reason not to speak to someone. In my mind I’d already been there and had the conversation and it hadn’t worked out well. The smallest of incidents or upcoming events would set my mind off racing again. This meant that when it came to bedtime, falling asleep was an incredible challenge as I was on high alert. I’d run through the events of the day and conversations I’d had and what I should have said. Then I would spend ages mentally rehearsing the challenging conversations the next day was going to bring until sheer exhaustion caused me to eventually nod off. Once asleep the chances of unbroken sleep was remote to say the least, regularly waking in what seemed to be the middle of a conversation in my head. This generally meant that I would wake the next morning as exhausted as I went to bed, hoping against hope that I would have a peaceful sleep tonight. The exhaustion meant that my already stressful and challenging job was made even more stressful and challenging. This made it difficult to be as sharp as I needed to be which only helped me to be even more anxious about what might go wrong. This naturally dented my confidence and self-esteem and as a result I began to doubt myself. I’d find it difficult to speak up at work and say what was on my mind as I feared my thoughts and ideas being rejected. The idea of speaking in front of a group filled my with such an intense fear it usually resulted in stomach cramps. Unable to express myself properly, I began to loathe going to work, a job I had loved for so many years. I’d have a big knot of anxiety in my stomach whenever I had to have anything but the most simple of conversations with colleagues. I felt constantly judged and inadequate. I hated Monday morning’s so much that the anxious anticipation on a Sunday was unbearable. Social occasions could only be tolerated with the Dutch courage of a drink in hand to silence the inner voice. Even at that they were far from enjoyable and best avoided whatever excuse could be found. And I got good at making excuses but this only served to make my world smaller. I felt trapped, persecuted and tormented by my own mind and I felt a sense of loss. I had not only lost control of my thoughts but also I had lost who I was. I had forgotten how to be me. I had forgotten how to be that carefree person that could be so full of life. Instead I had become serious, intense and stressed and seemingly devoid of a sense of humour. I felt hopeless and resigned to the fact that this is how my life was going to remain. But after hitting a low point about 8 years ago things changed. I started on a journey to discover how I could take back control of my mind. At first nothing much changed but as the alternative was living miserably with anxiety, I persisted. And the more I learned the more I started to change, slowly at first. Sometimes I didn’t even notice the changes but friends and family did. My outlook on life changed, joy returned to my life, I found my voice again and I discovered that change was possible. Today, my life is unrecognisable from what it was before. My success overcoming my anxiety lead me on a new journey, down a different career path. 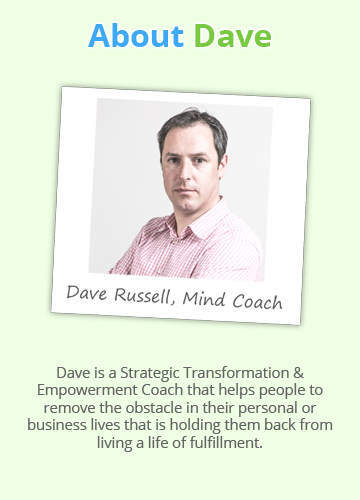 Now I help others that suffer from anxiety, stress or depression to take back control of their mind and as a result take back control of their life. I never believed that change was possible but it is only in changing that we can experience our true capacity for change. And the best thing about it was that in the end it wasn’t the difficult struggle that my anxious-self had imagined it to be. Today I regularly stand in front of large audiences without a knot in my stomach, without days of dreading beforehand but instead excited by all the possibilities that life can offer. If I can change – anyone can do it.